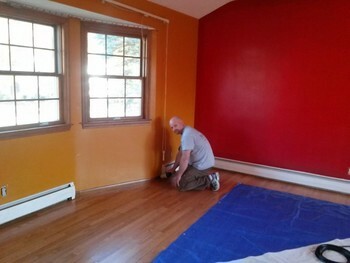 ScreenCoat Painting & Flooring LLC is pleased to offer interior staining and painting to Beverly residents. We have been in the home improvement business since 2001, making Beverly homes like yours more valuable, livable, and marketable. We are known for our meticulous attention to detail, courteous service, and competitive pricing. Call (978) 216-2016 when you're looking for an interior painter in Beverly, Massachusetts. We specialize in all interior painting projects, including wall painting, ceiling painting, trim & woodwork, and more. A fresh coat of paint can give every room in your Beverly home a whole new look. From plain vanilla to gunmetal grey, we've got whatever color you want. ScreenCoat Painting & Flooring LLC's computerized color match service gives you the exact shade you want every time. When you're ready to make a change to your color scheme, call (978) 216-2016 to find out how we can help you get the look you want by painting the interior of your Beverly home. Competitive pricing packages available when you book multiple rooms. Classic, neutral, or bold. Interior painting lets you experiment with any color palette for a much lower cost than furniture replacement or other pricey renovations. ScreenCoat Painting & Flooring LLC painters will help you select your paint color and test it on your walls so you can see how it will look. All interior surfaces are expertly prepared to ensure the smoothest possible coverage. From flooring to interior staining and painting, let ScreenCoat Painting & Flooring LLC take care of all your Beverly home improvement needs. We've been painting Beverly homes for more than 18 years. Make your Beverly home the envy of the neighborhood.